The FSF has a new campaigns team, and we've wasted no time in hitting the streets to advocate for free software. 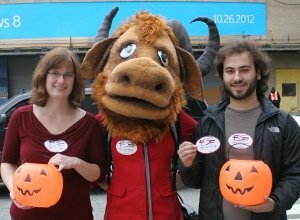 Campaigns managers Libby Reinish (that's me) and Zak Rogoff took our GNU mascot to do a little early trick-or-treating at the Windows 8 launch in NYC this October. We handed copies of Trisquel out to folks standing in line to get a glimpse of Microsoft's new Frankenstein monster, a truly scary operating system that will keep users subjugated. Our trick-or-treat action is just the beginning for us. Zak, Kÿra and I have big plans to expand the FSF's ability to reach beyond our base and engage more people than ever before in the free software movement. We are re-imagining how the FSF can support people who want to switch to free software, planning new ways to get our boots on the ground to distribute free software, and scheming fresh tactics to stop DRM and protect user freedom. We want to hear your ideas for promoting free software and standing up to companies that control their customers with proprietary software. So please, shoot us an email at campaigns@fsf.org and tell us what campaigns you think we should focus on next.